In the 1970s, the New York Zoological Society [NYZS] increased its efforts in international conservation, sponsoring external researchers and conservationists with projects that furthered the NYZS mission of protecting wildlife and wild places. NYZS-sponsored researchers conducted field work in countries far from home, often for several months at a time. Reporting back to the Society, they shared exciting scientific findings or provided updates on conservation efforts in regions including East Africa, Central America, and Southeast Asia. But amid the progress reports and publications full of data from the field, the correspondence from field researchers gives a sense of the physical and logistical difficulties of conducting international research. 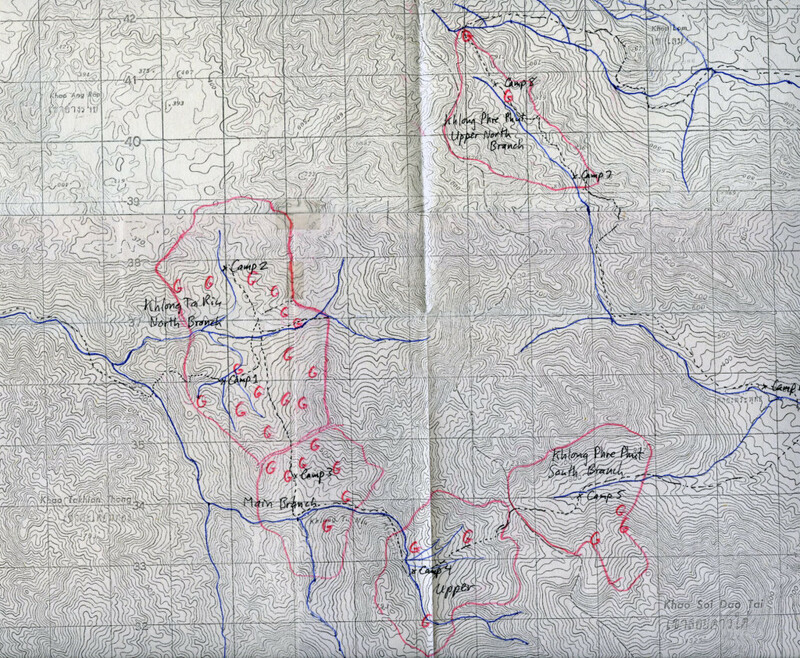 Warren Y. Brockelman’s annotated map of pileated gibbon research area in the Khao Soi Dao Wildlife Sanctuary, Chanthaburi, Thailand, 1977. Though working relatively recently, field researchers in the 1970s and early 1980s had limited options for communication from these remote locations. 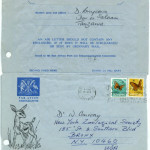 Correspondence with NYZS officials often included laments about lost mail or apologies for long delays. 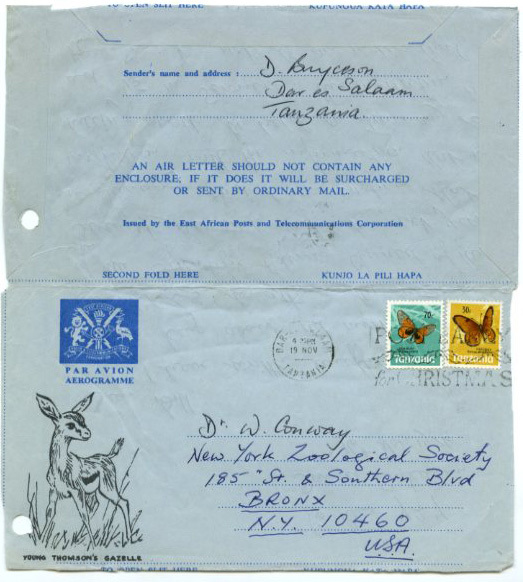 For example, elephant ecology researcher James D. Allaway had to apologize to the Chair of the Society’s Conservation Department, F. Wayne King, for the delay in sending his six-month report: “I’m sorry not to have replied before now [July 6th] to your letter of March 19th, but I didn’t receive it until mid-June when I returned to Nairobi from the Tana.” Even primate researcher Jane Goodall, whose work with chimpanzees at Gombe Stream Research Center was funded by NYZS during the 1970s, lamented, “I feel a little frantic that half my letters never seem to arrive in America! Or else people’s replies never arrive in Tanzania!” (Jane Goodall to NYZS trustee Charles W. Nichols Jr., Oct 1st, 1978). 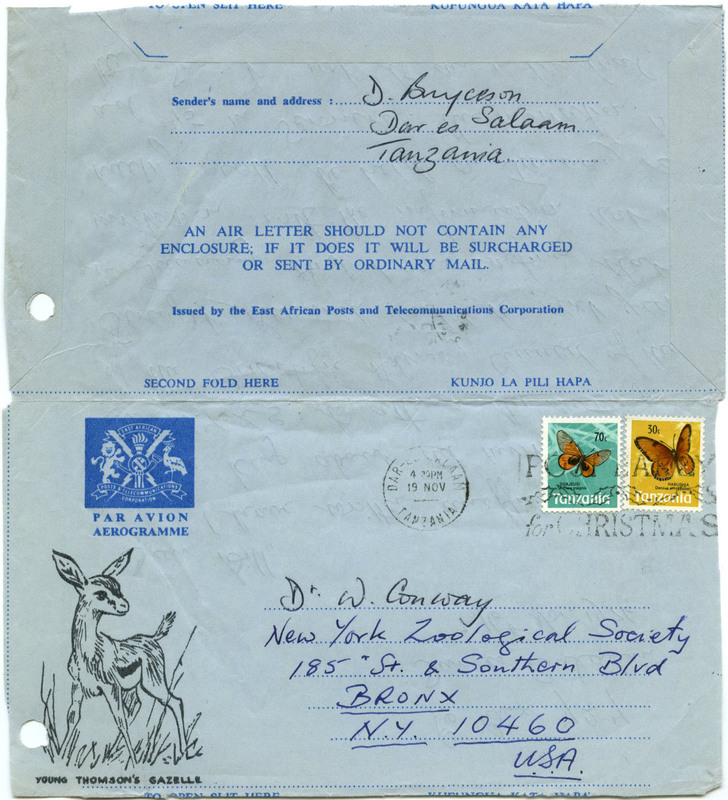 An airmail sent by researcher Derek Bryceson in Tanzania to NYZS General Director William Conway in November, 1976. 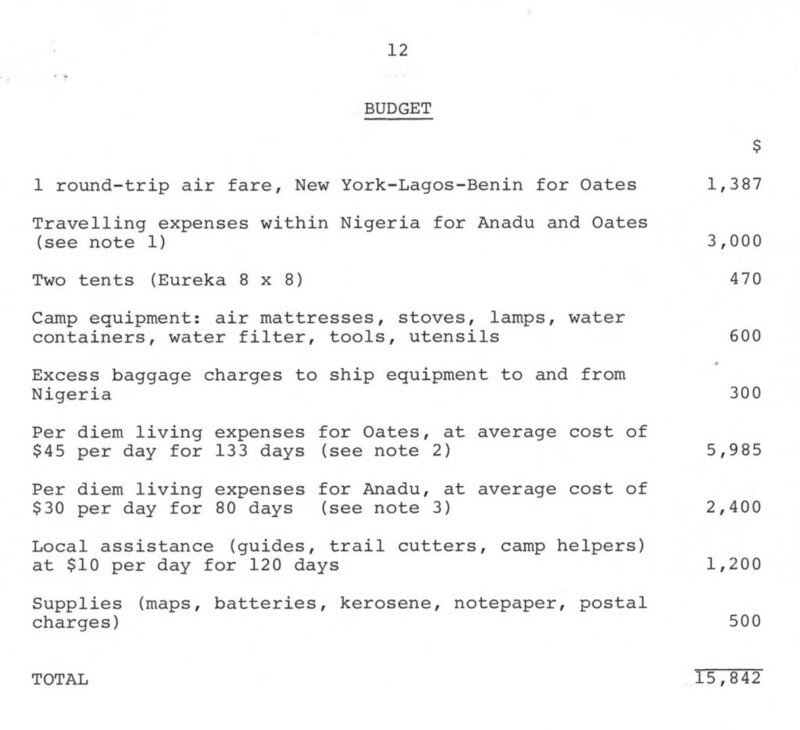 Budget request by John Oates listing field supplies, in a project proposal to survey wildlife in Bendel State, Nigeria, July 1981. In 1981 the Society gave some of its trustees a chance to experience field conditions for themselves with an African safari trip to Sudan. Trustees, including Dr. Henry Clay Frick, Mr. and Mrs. John N. Irwin II, and John Pierrepont, made up the first group of tourists to visit the Boma Plateau in South Sudan, staying in a tented camp site that differed greatly from a modern U.S. home. 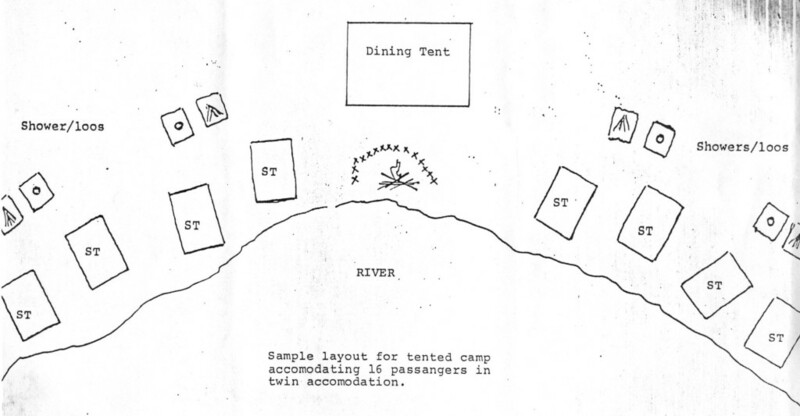 A sketch conveying plans for the camp, included in a letter to trustees considering the trip, late 1980. 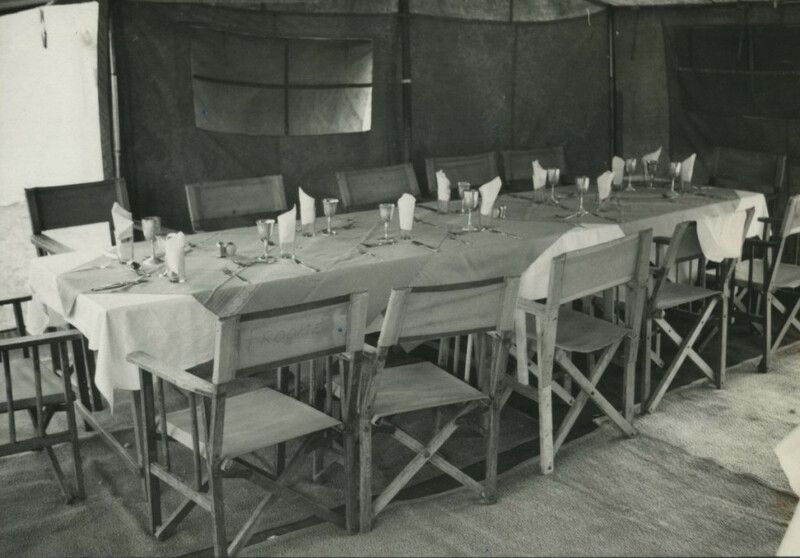 Boma Plateau camp dining tent with the table set for visiting NYZS trustees, early 1981. The willingness of New York Zoological Society field researchers–and now Wildlife Conservation Society field researchers–to endure long journeys, isolated conditions, and sometimes harsh living conditions is a testament to their commitment to wildlife conservation and the basic science needed to support it. Because these researchers are prepared to travel into the field, other scientists, conservationists, and the public at home are able to learn more about wild animals and the remote places in which they live. This post is by Alexanne Brown, who worked during Spring 2014 with the WCS Archives as an intern processing a collection of reports and correspondence pertaining to research projects funded by NYZS’s various international conservation departments and programs over the years. All items cited come from that collection: New York Zoological Society. International Conservation bluebooks, 1962-1993. Collection 4041. A fascinating glimpse into the workings of this extraordinary organization and the people whose work has made it so successful. More, please?